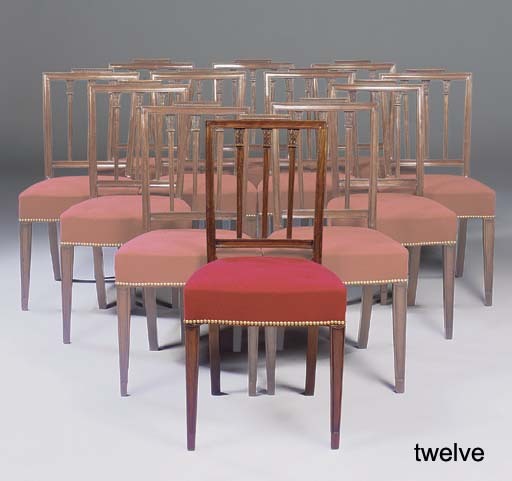 The parlour chairs, with their flute-sunk rails and triple palm-capped pilasters, reflect the French/antique fashion popularised by A. Hepplewhite & Co.'s The Cabinet-Maker and Upholsterer's Guide, 1788. They are similar to a pattern for an arched 'Spanish-back' chair in the 1789 Estimate Sketch Book of Gillows of London and Lancaster (L. Boynton (ed. ), Gillow Furniture Designs 1760-1800, Royston, 1995, no. 279).